Some of the most-watched Healthcare IT News videos in 2015 were from our collection of exclusive interviews and footage recorded at HIMSS15. From recognizable names in leadership commenting on burning issues to attendee remarks and event highlights, our coverage doubled our viewership from the previous year. 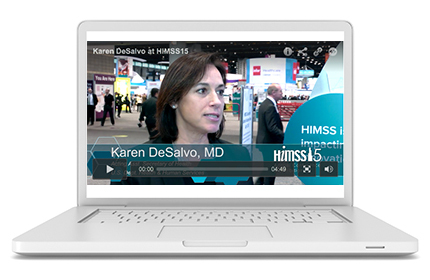 As HIMSS16 fast approaches, check out this list of 2015's most popular video content from the HIMSS Annual Conference and Exhibition below. Our monthly CIO Spotlight and Clinical Spotlight series connect viewers to top IT and clinical professionals presenting a variety of perspectives on how the industry is evolving, highlighting their unique challenges and accomplishments. We listed 2015's top five most popular episodes from Healthcare IT News Spotlight Series below (just in case you missed them).